Science fiction movies have long made us elaborate promises about the future – both good and bad. Sometimes those promises are about big, society changing things like space travel or teleportation, but there are plenty of smaller scale predictions too, inventions that make up the fabric of these future societies. One of these is digital and interactive signage – many movies have made use of this kind of technology to show you their vision of the future. You’re probably pretty familiar by now with digital signs; billboards, in-store displays, or even roadside signs. These digital displays aren’t significantly different from your TV or PC monitor, however – they’re playing pre-recorded or non-interactive content. They’re not quite what science fiction imagines. Santa Clara-based YouSpace is working on changing that – with the help of Intel RealSense Technology. The YouSpace Total Experience Kit (TEK), includes the Intel® RealSense™ D430 Depth Module*. This kit can be added to any digital display to turn it into a smart, interactive and responsive display. This display can then detect any humans standing in front of it, and interpret their actions. This opens up a whole new, futuristic world of possibilities. Imagine a shopping mall store directory that can respond to your choices – maybe you’re just interested in children’s clothing stores, so it could highlight all of those on a map for you after a gesture or two, and then show you a selection of items in that category that are on sale. There are many reasons that public displays don’t really work as touchscreens – hygiene, general cleanliness (think displays covered with fingerprint smudges) and of course the additional expense of replacing a digital screen with a touchscreen. That’s why this kit makes great sense. The use of an Intel® RealSense™ Depth Camera means that all gestures and interactions can be touch-free, an important consideration for public spaces, and there’s no need to replace existing screens. 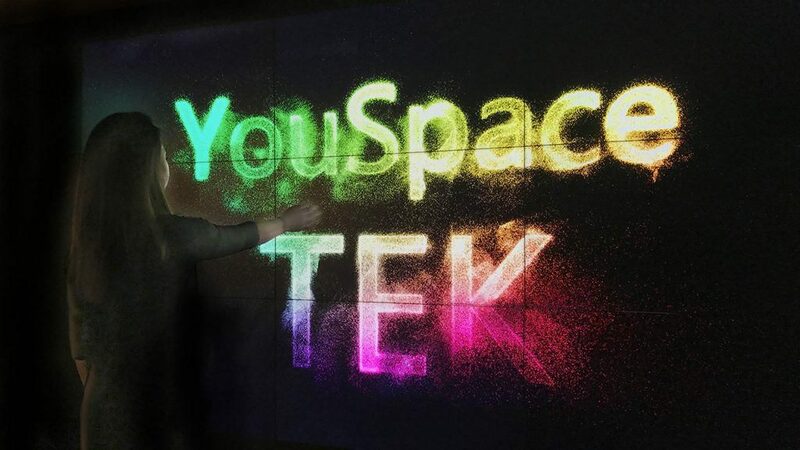 YouSpace’s machine learning algorithms interpret the point clouds generated by the depth camera and detect the presence of a human body, along with specific gestures, allowing developers to create novel and custom experiences where the display responds to the presence and actions of the person standing in front of it. That isn’t the only thing that this solution adds to a digital display, however. Because the sign is now interactive and can understand human presence, the backend of YouSpace, the YouSpace Hub allows the sign owner to capture how many people passed by, stopped, and interacted with the display content – which quickly allows them to discover which content attracted the most attention, or which display locations work the best for each type of content. Along with advanced AI analytics, the Hub also allows the owner to create touch-free, gesture based content straight from their browser, schedule their content flow with playlists, and automatically change content based on time, day and the presence of people standing in front of the display. By including Intel® RealSense™ Depth Sensors in their Total Experience Kit package, YouSpace could take advantage of our open source software to obtain high quality, real-time depth streams, in a compute-friendly package. Since all the depth processing happens on camera, all of the compute power of the rest of the system is available for the experience, display and interactivity. This makes any system design easier – since you don’t need to add extra power for the camera compute, you can design a cheaper system with a smaller form factor. Intel RealSense Depth Cameras will run easily on any Intel NUC system, while still allowing you to maximize the power you have for interactive experiences. What does an interactive future look like? Imagine a digital display that could, with the wave of a hand, show you holding the exact purse that’s on sale in another area of the store. Or how about a display that can turn into a playful space for you and your children? Remember this scene from the Tom Hanks movie, Big? Haven’t you always wanted to experience something like that giant playable keyboard? You could go and see the original, which was purchased by Macy’s from FAO Schwartz in 2016, in their 34th St. location in New York but of course, that isn’t accessible to everyone. While that’s a different kind of interface from the YouSpace system, it’s a large scale, public play experience. Studies have shown that these kind of installations can encourage behavior changes in users. Interactivity is the key here, allowing people to use their own bodies to control and interface with compelling technologies almost instantly encourages more active and engaged behavior. With the system from YouSpace these fun, collaborative experiences become affordable, available and accessible to any retailer, and those experiences could change from day to day and from year to year. Arthur C. Clarke famously said that “Any sufficiently advanced technology is indistinguishable from magic.” Think of a certain wizard’s world – portraits that would wave to you, whose eyes follow you around, and who act like real, living humans. This technology makes such magical experiences possible. A digital display equipped with the YouSpace TEK could recreate that experience in a way that would be believable, without the need for movie magic. YouSpace TEK pre-orders started on November 5th. *Please speak with your Intel RealSense Sales representative if you are interested in purchasing our technologies in module form for integration into full solutions. Just getting started? The Intel RealSense D435 and D415 Depth cameras are the best choice for you to get your prototypes up and running quickly.